Once, to enter Kerch everyone had to pass through the city gate with a barrier and guards. 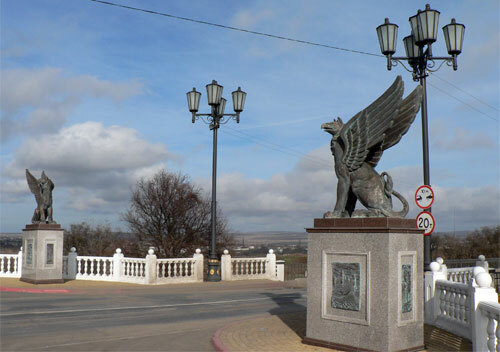 The entrance to the city was decorated with gryphons on the top of high columns. 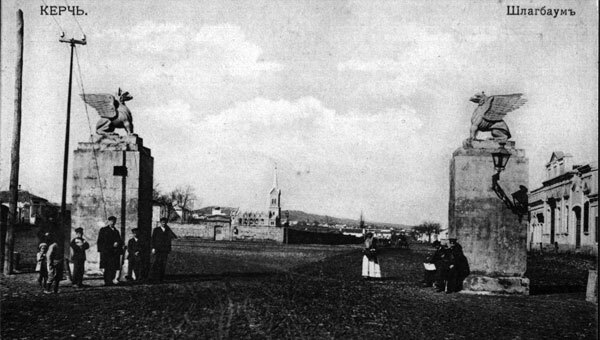 Shlagbaum Street and Shlagbaum Square was a sort of a border between the city and the Russian-Tatar forstadt. 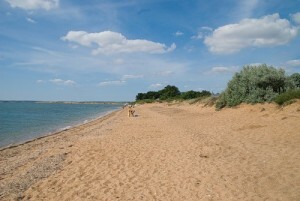 The city’s citizens called the place «Shlambova» or «Eagles», and the Tatars named it «Coosh-Cape» or «the Birds’ Gate». From the gate there ran a street and in the middle of the street there was a park where people could stroll. Later, the street was named after the famous surgeon N. I. Pirogov. The city hospital, the handicraft school, and an institute for young ladies trained in noble etiquette (founded by the city governor Z.S. Kherkheulidze) were all located on this street. P.A. Dubrux, one of the founders of the Kerch Museum of Antiquities, and Yu.C. Terapiano (Toropiano), a famous Russian poet, writer, literary critic and publicist, lived on this street for some time. On Sh’lagbaum Square, there was a trade school (now school № 9 named after P.P. Shmidt) and the main city’s Orthodox Temple, the Cathedral of Holy Trinity. The Cathedral functioned until 1931 and was also the place where a famous priest named St. Luke (V.F. Voyno-Yasenetsky) was baptized.